The Netflix engineering ecosystem is constantly evolving. Our use of the immutable infrastructure pattern, expanding polyglot choices and unique culture empowers engineers to adopt the tools, frameworks and languages they deem the best fit to manage their services. With this freedom comes the responsibility to manage how those choices may introduce changes into our shared environment. The Change Engineering team provides tools that empower engineers to propagate change efficiently. By doing this, we enable productivity in this ever-changing landscape by providing static and dynamic discovery endpoints and user interfaces designed to help engineers better understand the relationships and dependencies between services within the Netflix ecosystem. Here are some use cases our team serves: - How can I identify consumers of my software and how can I get my consumers to effectively adopt my changes?- As a library owner, who am I impacting if I make a change? - How can I communicate this change and monitor adoption?- How do I find out where that line of code is deployed and who’s using it? - How do I learn which engineers are writing code against a particular library? - If I change this API, who will I impact? Engineers use insights gained from the data they collect to make changes in environments, provide feedback to other engineers, and help more-easily manage and control overall productivity for their teams and others reliant on their shared artifacts. The result of their efforts leads to a more safe engineering ecosystem, reduced technical debt, and minimized dependency skew. 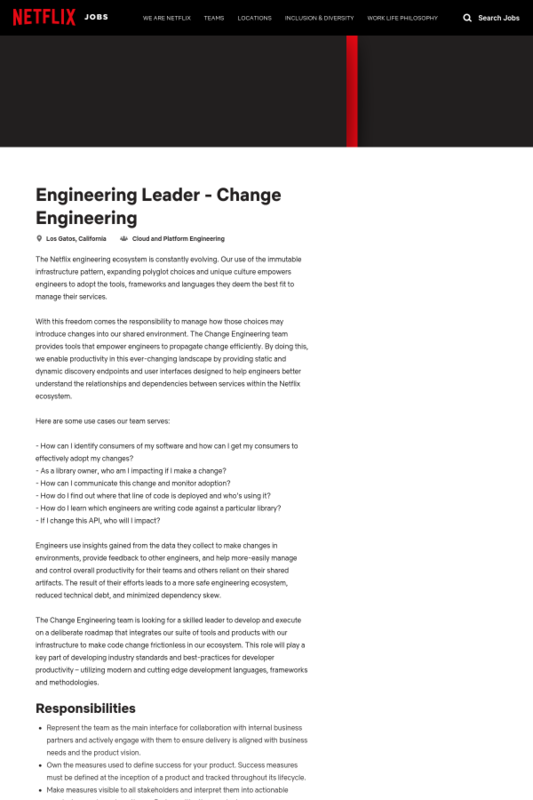 The Change Engineering team is looking for a skilled leader to develop and execute on a deliberate roadmap that integrates our suite of tools and products with our infrastructure to make code change frictionless in our ecosystem. This role will play a key part of developing industry standards and best-practices for developer productivity – utilizing modern and cutting edge development languages, frameworks and methodologies.